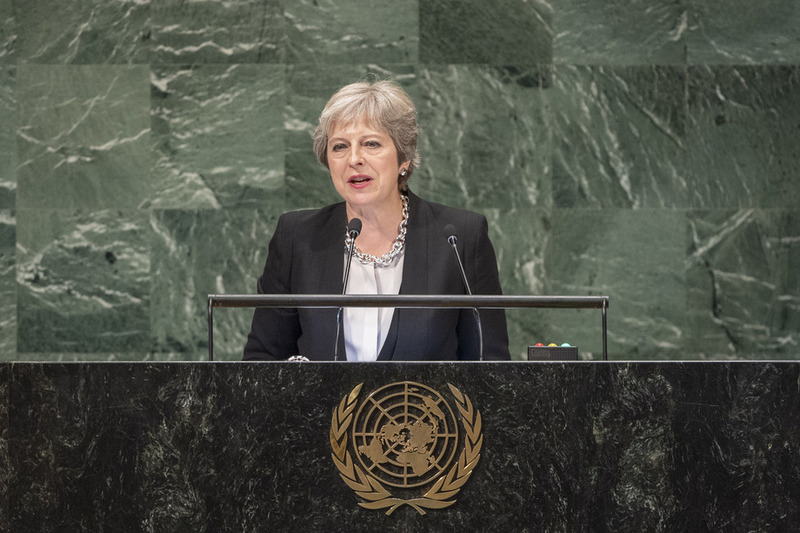 THERESA MAY, Prime Minister of the United Kingdom, noted progress in the world, including the number of people in poverty halved and the fact that today millions lead healthier lives. Yet, today, many are concerned whether this future will continue, especially as the cold war’s end has not led to liberal democracies for the common good. “We face a loss of confidence in those systems,” she said, adding that the belief in free markets was challenged by the financial crisis of 2008, as well as other issues such as the mass movement of people across borders. These doubts are understandable, as is the need for leadership, she noted, adding that “we have a duty to respond”. If world leaders lack the confidence to step up, others will instead. Spotlighting fascism, she said the world has witnessed a rise of such movements and the results when countries slide into authoritarianism and oligarchs rule. The Russian Federation’s breaching of international norms is evidence of this, she said, noting the use of chemical weapons by agents of the GRU [Main Directorate of the General Staff of the Armed Forces of the Russian Federation]. The international community needs to show there is a better way, based on inclusive societies, she urged, stressing that delivering for citizens at home did not have to be at the expense of global cooperation. “It is only global cooperation that can harness legitimate self-interests,” she said. Through the United Nations there is a shared commitment within a rules-based international system and this commitment takes into account small vulnerable economies and benefits all citizens. However, “we need action to show how we can deliver and we must recognize the legitimacy of concerns. We must invest in building open societies and must stand up for our values for those who may suffer,” she said. Outlining a series of priorities, she said that the international community must respond to those who think the global economy has left them behind, and must make the economy work for all people. Fair rules on trade and tax are needed; this includes giving the World Trade Organization (WTO) a mandate for reform. Fair and respected rules can drive growth. Second, she noted economies must be built that are inclusive and where every citizen has a stake. History has consistently demonstrated that giving everyone at stake ensures security.